The Larson Electronics EPF-8P-E Explosion Proof Fan/Blower with 25 foot static conductive duct safely and effectively redirects stale air from hazardous location areas. This explosion proof blower meets UL, Canadian UL and CE standards for hazardous locations, is suitable for confined spaces, and provides high 1,570 CFM output for effective airflow in larger spaces. This electrically powered explosion proof fan (blower) is suitable for confined spaces and is approved to UL , CUL, and CE safety standards for hazardous locations. 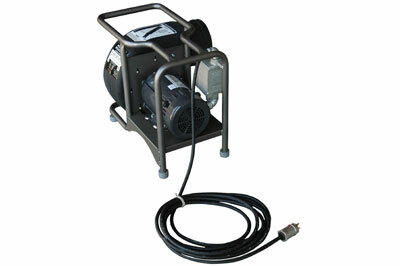 This fan features a high efficiency 3/4 hp motor which is fully enclosed, and an aluminum, non-sparking blower wheel for high output and protection against accidental ignitions. This fan has 8 inch intake and exhaust flanges and produces 1,570 CFM of air output for excellent movement of air in large areas. The entire fan and motor assembly is fitted to a heavy duty dual carry frame constructed of powder coated steel with steel safety guards and insulated foot pads for easy setup and transport. 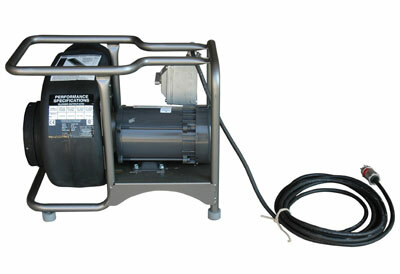 Other features include an explosion-proof switch, installed static grounding lug, and a 25 foot cord fitted with a 15 amp, explosion proof plug. 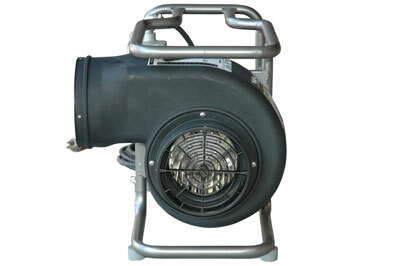 Note on Explosion Proof Fans: Can be used as an intake and exhaust fan. • Pre-wired with a 15 amp, explosion proof plug. The included 25 foot long duct is a single-ply polyester reinforced PVC vinyl fabric hose design with an extrernal wearstrip reinforced with a spring steel wire helix. It is lightweight for blower applications and highly compressible. The retractability of the static conductive duct allows for convenient storage and easy transport in a fraction of its fully extended length and has low friction loss. The wearstrip offers external abrasion resistance, and is listed as YL 94 V-0 flame retardant. Ambient operating temperature for this unit ranges from -20 degrees to 180 degrees Fahrenheit.